Windsurfing Lessons - Photos from Poole Windsurfing. 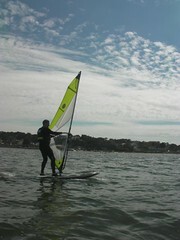 June got off to a great start for our windsurfing courses. We had lots of lessons running, group beginners windsurfing courses, windsurf hire & some of our regulars getting back into their windsurfing ready for the summer! 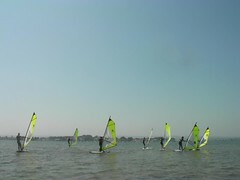 The week started with some beginners windsurfing lessons for which the students scored some really nice conditions. Lots of our students were out practicing what they have learnt on our windsurfing courses with some windsurf hire time. Practice makes perfect! 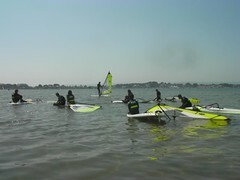 The weekend was a bit breezier, good for the 2nd half of the full beginners windsurfing courses. Also, great for some of the student who had been on intermediate windsurfing courses and were out practicing faster tacks, beach starts & harness. Come & join in the fun at Poole Windsurfing and learn to windsurf – a great new summer activity for you! Remember we have a really good Full Beginners Windsurfing Course Discount where you can get £11 off the normal price when booking your 2 sessions upfront, with us at Poole Windsurfing.